The Sidebar: Hype tripe: Cincinnati press agent claims "Heimlich Heroes" first aid training program "expanding nationwide" via partnerships with the YMCA and two other national nonprofits -- the program's manager says "NOT"
Hype tripe: Cincinnati press agent claims "Heimlich Heroes" first aid training program "expanding nationwide" via partnerships with the YMCA and two other national nonprofits -- the program's manager says "NOT"
A few days ago I e-mailed media reps at the American Heritage Girls, the YMCA, and the Boys & Girls Clubs of America, and asked for details about the partnerships. 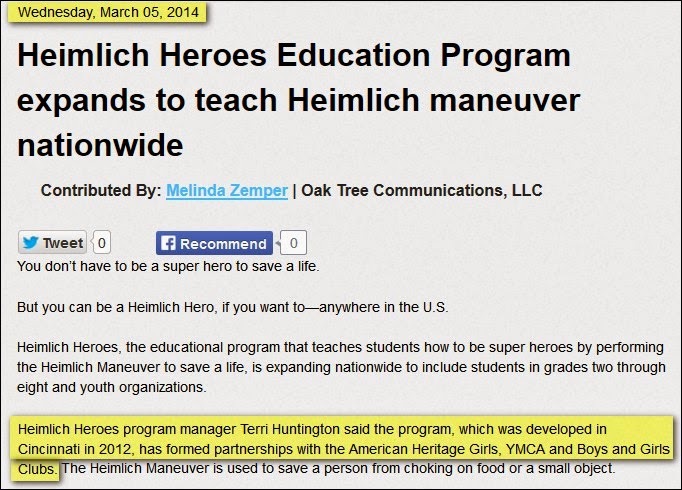 I also e-mailed some questions to "Heimlich Heroes" program manager Terri Huntington. I want you to know that the nature of the relationship with the organizations you mention was overstated...Heimlich Heroes has NOT formed a formal partnership with any of the organizations listed. Also see my February 26, item, "Heimlich Heroes" program teaches Ohio students a choking rescue treatment NOT recommended by Heart Association and Red Cross -- I've asked the OH and Hamilton County Health Departments to review the program.